A State by State LGBT Travel, Wedding, Relocation and Business Resource Guide. YELLOW: Pride Guide States! RED: Coming Soon! Click the state you want and then click the site. ThePrideGuides.com © , MC Publishing,Inc. All Rights Reserved. 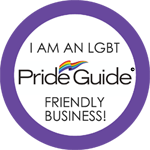 "Pride Guide" is a registered trademark of MC Publishing, Inc.